My Inner Big-Bang: You Have The Immense Power To Change Your Life. 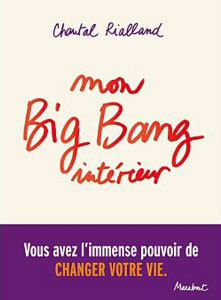 French Title: "Mon big-bang intérieur, vous avez l’immense pouvoir de changer votre vie "
It’s everyone’s dream to achieve more happiness, to live life to its fullest, and to be in harmony with others. In this book Chantal Rialland gives you the keys to achieve all this with concise, practical, and simple examples of how to deal with the problems that arise in your personal, practical, and professional life. How better manage your inner world, your thoughts, your feelings, your emotions, and your reactions. Yes, you can create your inner big-bang. Your life will change once and for all. This book is a passport to happiness.